England qualified in style for Euro ’80, winning seven of their eight matches to secure their place in the finals. This was to be the first European Championship to resemble a proper tournament, with the quarter-finals no longer played over two legs. Instead there would now be two groups of four teams in Italy, with the winners of each section progressing to the final. England were in the easier-looking of the two groups, having avoided a section which included holders Czechoslovakia, World Cup runners-up Netherlands and 1974 world champions West Germany. Instead, England’s main concern looked to be the hosts Italy, who they would face along with Belgium and Spain. The qualifying campaign had raised expectations for England, along with an impressive 2-0 away win in a friendly against Spain in March 1980 and beating world champions Argentina in May. But four days later they were brought down to earth with a 4-1 loss to Wales at Wrexham. It was hard to be sure just how England would fare in Italy, but if Ron Greenwood could replicate the success of English club sides in Europe then they had every chance. While the national team had been experiencing a lean period, English clubs had dominated the European Cup for the past four years with Liverpool and Nottingham Forest each winning it twice. Both clubs would be well represented in the squad, including the goalkeepers of Ray Clemence and Peter Shilton. This tournament would see Greenwood let the goalkeepers share duties, as he would continue to do until he finally picked Shilton as clear number one for the 1982 World Cup. One unfortunate absentee was forward Trevor Francis, ruled out through injury. England’s absence from recent major competitions meant for virtually all the squad this would be their first major tournament, with Emlyn Hughes the only player left who went to the 1970 World Cup in Mexico (he didn’t play in either competition). Kevin Keegan had become the star England player of his era, but this was finally his chance to appear in a major finals. There were injury concerns about him prior to the competition, but he insisted he was fit to play. “I’m ready for Italy. There are no excuses now if we don’t do well,” he said. The build-up seemed very low-key by today’s standards. The back pages were dominated by cricket until the tournament began and England flew out to Italy just two days before their opening match. England may have been back in the big time, but this clearly did not compare to the World Cup – although they visited 10 Downing Street shortly before the finals. 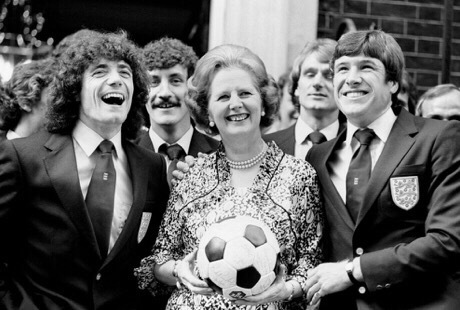 Kevin Keegan seemed to see the funny side as he met Prime Minister Margaret Thatcher! England would start their tournament against Belgium in Turin on June 12. The Belgians were quoted as saying they did not expect to beat England, but Greenwood wasn’t buying it. “We don’t in any way underestimate them,” he said ahead of the match. 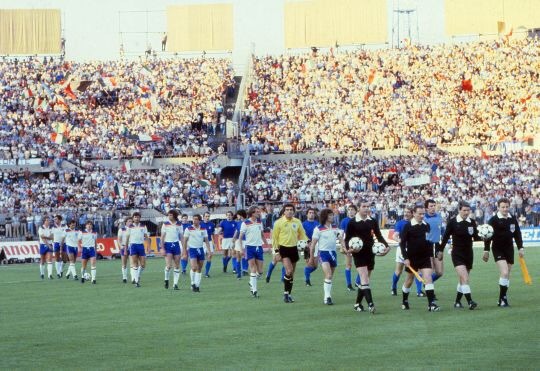 “They are a strong side, a side with experience even if they are unpredictable.” The tournament was blighted by poor attendances and just 15,186 were in the Stadio Comunale to see Ray Wilkins put England ahead after 25 minutes. Not a renowned goalscorer, Wilkins expertly played the ball over the Belgian defence and ran through to then chip goalkeeper Jean-Marie Pfaff and score. Surely this goal would set England on their way to victory and potentially a place in the final? Sadly not. Just four minutes later Jan Ceulemans equalised for Belgium. Tear gas was sprayed during England’s match against Belgium. The match was always going to struggle to get going again after the trouble, but in the closing stages England thought they had regained the lead through Tony Woodcock. But his effort was controversially ruled out and the decision would prove significant in the final reckoning. The match ended 1-1, representing a point dropped for England but with them still in with a shout of reaching the final. England fans were now being urged to hide their colours en route to their next match – a Sunday night showdown with Italy in Turin. It was a match of vital importance, both in terms of England’s hopes of winning the tournament and the need for their fans to behave themselves. Off the field there was mercifully no repeat of the scenes three days earlier, with most England fans having walked together from the railway station in a bid to avoid attacks. On the pitch, whoever lost was staring elimination in the face. Italy had drawn 0-0 with Spain in their opening game, with the Spaniards then losing to Belgium. The Belgians were emerging as a surprise package, but the match between Italy and England was the blue riband fixture of the group and a crowd of 59,649 was the highest of the tournament. Italy’s preparations for the tournament had been hit by a bribery scandal, with forward Paulo Rossi banned as a result. England and Italy prepare for their group stage showdown. Greenwood again made changes for the Spain game, meaning 19 members of the squad enjoyed gametime in Italy. Trevor Brooking gave England the lead, but three minutes into the second half Dani equalised from the spot. He strode up to beat Clemence with another penalty a few minutes later, only for the referee to spot an infringement and order a retake. This time around Clemence saved and England were off the hook. They took advantage of this with Woodcock restoring their lead to give them a 2-1 victory. England had created a series of chances in the match with Spanish goalkeeper Luis Arconada continually denying them. But Greenwood wasn’t overjoyed with the win. “We played much better against Italy,” he admitted. Ray Clemence saves a penalty as England beat Spain. England now basically needed a team to win between Italy and Belgium later on to reach the third place match, certainly if the Belgians lost by at least two goals. But it wasn’t to be. 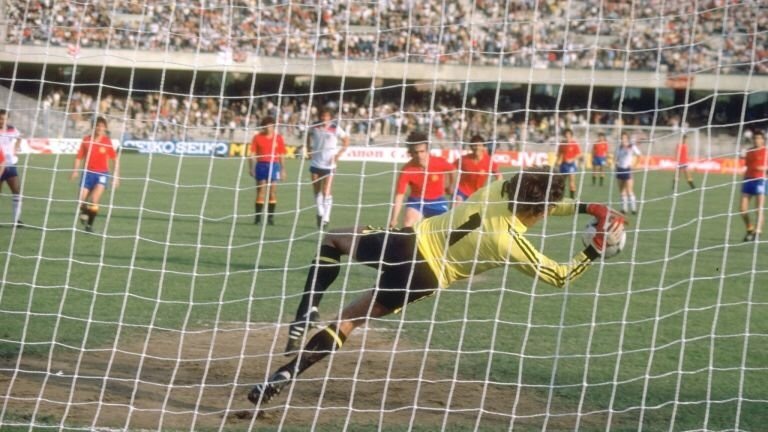 Italy could not make the breakthrough, with the 0-0 draw meaning Belgium were surprisingly through to the final against West Germany. Italy’s dreams of glory were over, the only goal in any of their three group games being their winner against England. For England, the tournament set the trend for their other overseas European Championship appearances over the next 20 years. They would make a swift return home and with the conduct of a section of their fans having brought shame upon the nation. 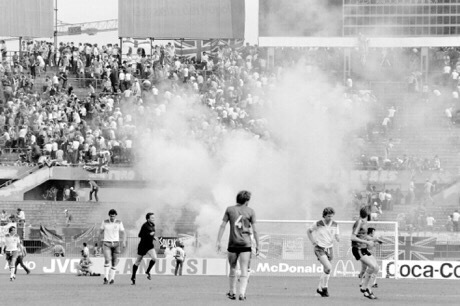 We have previously recalled how Euro ’80 – or Europa ’80 as it was generally known at the time – was not considered a success amid low crowds, negative tactics, criticisms of the competition’s format and the hooliganism seen during England’s match against Belgium. That would unfortunately be the tournament’s lasting image in England. The ‘English Disease’ was taking hold and further violence would follow on several occasions when England travelled abroad in the ensuing years.